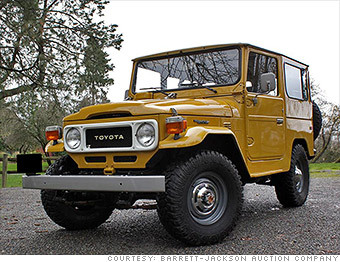 Old-school off-roaders have finally become desirable items at collector car auctions. "Real" SUVs are fading away, replaced on car lots by "crossover" SUVs, which are derided by some as little more than puffed-up station wagons. The old, classic models are from a time before they were cool, when they were simply vehicles engineered for a purpose -- and they were even used for that purpose. At collector car auctions, values of classic SUVs have risen steeply in recent years, according to Hagerty Insurance, which insures collectible cars. Toyota's Land Cruiser has never lost that sense of purpose. Modern examples of the vehicle are still as likely to be found on the African plains as at the shopping mall. But collectors favor the true classics. In the past five years, the value of classic Toyota Land Cruisers in excellent shape has more than tripled, according to Hagerty. The one shown here sold for $88,000 at Barrett-Jackson's Scottsdale auction in January. All values in this gallery are for vehicles in "very good" condition and are averaged across all the model years given.